Too much partying and lounging under the mid-day sun? 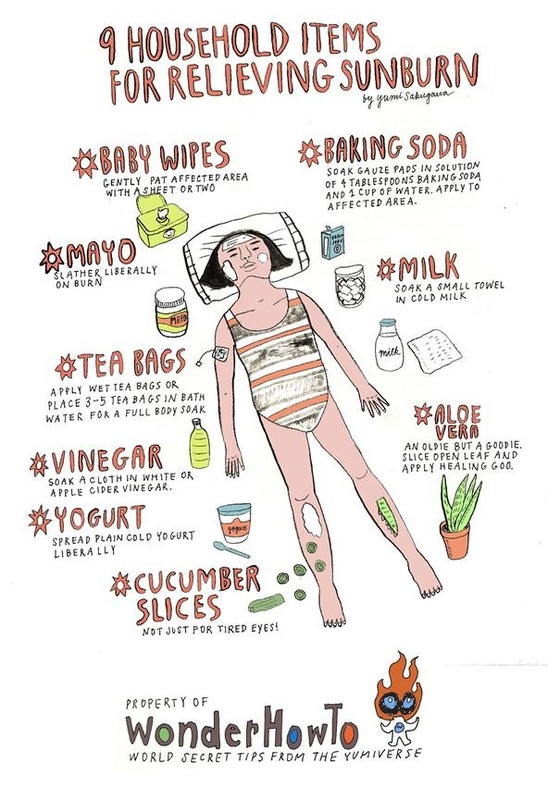 If your attempt at a toasty caramel tan has instead resulted in a bright red sunburn, you fortunately have many common household items at your disposal to relieve the discomfort and speed up the recovery of your burnt skin. Take note: The best way to avoid sunburn is prevention, and there are plenty of good reasons to avoid excessive sun exposure. Too much sun exposure increases your risk for skin complications such as liver spots, actinic keratoses, dry, wrinkled skin and skin cancer. So don't forget to wear your sunscreen, sunglasses and hats anytime you are outdoors for an extended period of time. It'll save you the trouble of concocting a cold yogurt mask or a teabag bath. love this one, yumi! the drawing is so fantastic. i like how the tips are centered around a central image. would make a great mini-poster for summer... to take on your fridge etc. I will suggest the best and workable trick and want to share here with all users. Mix tea bags with milk and then apply on the affected area. It is one of the natural ways to treat sunburn.